Vascuzell´s CEO Héctor Perea will be holding a 2-hour lecture on the biocompatibility of vascular implants as guest lecturer within Prof. Erich Wintermantel´s acknowledged semester course Principles of Biocompatible Materials. The lecture will provide a comprehensive review starting with the origins of vascular disease followed by current treatments, remaining challenges and the therapies of the future. The Lecture Principles of Biocompatible Materials is attended regularly by students from several faculties of the Technical University of Munich (TUM) with diverse academic backgrounds including medicine, engineering, biology and physics, thus providing a unique platform to fully address the complexity of this extraordinary interdisciplinary field. Venue: 18.12.2013 at 11:00. Institute for Medical Engineering, Boltzmannstrasse 11, Garching bei München. Vascuzell has successfully secured CE Mark approval for its unique cell seeding platform, the Endothelizer™ EN-2212. The device is designed to coat the inner surface of vascular grafts and patches with vascular cells to improve the biocompatibility and in-vivo performance of these implants. The CE Mark approval was received following a review of the safety compliance by a third-party notified laboratory. Given the growing interest for nanotechnology in society today, Alicante University will host the second edition of the summer course "Nanotechnology - Solutions and Challenges". Héctor Perea will participate as invited speaker to share Vascuzell´s experience as nanotechnology-based startup in the field of medical engineering. Further national experts in nanoscience and other nanotechnology disciplines will be present, including two of the most prestigious scientists at national and international level, Nazario Martin and Eugenio Coronado. 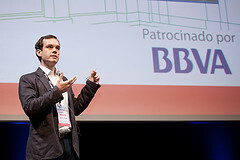 Héctor Perea, Vascuzell co-founder and CEO, receives TR35 Spain Award by MIT Technology Review Magazine. The TR35 award recognizes yearly the world's top innovators in emerging fields of science and technology under the age of 35. Héctor Perea has been recognized for his work in the field of biomedicine. Vascuzell will be present at the EmTech conference to be held in Malaga on november 22nd and 23rd. EmTech is the world's leading conference on emerging technologies, organized by Technology Review, from the Massachusetts Institute of Technology (MIT). Every year, leading scientists and researchers present the most innovative technologies of the moment, even those unknown to the general public and candidates to improve the lives of people, transforming society and business in the coming years. Vascuzell will be attending the EmTech@MIT conference which gives you access to the most innovative labs, companies, and entrepreneurs from around the world and shows you where to lead your organization in order to stay ahead of the curve. Vascuzell will be present as invited speaker at the Universal Biotech Innovation Days in Paris. This conference is designed to promote early-stage innovation biotech and to enable Pharma and investors in their business development & licensing efforts to source new platform technologies and innovative products.